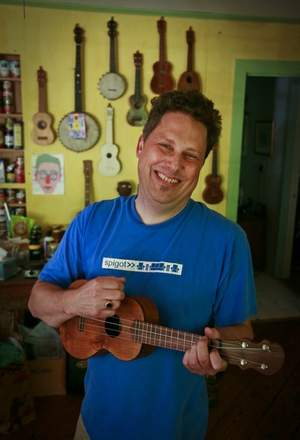 The new-old instrument has become a passion for Morin over the past decade, and in May, although he loved teaching middle school, he quit his job to make ukuleles full time. This summer he added a blog to his website (www.russmorin.com). “It’s a whole subculture, and it’s becoming more mainstream, like with Eddie Vedder,” Morin says. Oh yeah, Eddie Vedder got on the ukulele bandwagon, too. The Pearl Jam singer released “Ukulele Songs” earlier this year, and the 16-track album has received much acclaim. Dianne Sutton feels the same way. The longtime ukulele lover says the instrument’s enduring appeal is not just the happy sound it makes, but also the ease of playing it. Sutton believed in the instrument’s merits so much that she started the Upstate’s very own ukulele group five years ago. The YesterUkes began as a recreational thing, but now the 20-member group plays gigs around the region. They are booked through spring. Morin’s ukulele love story truly began from the intersection of music and woodworking. He played piano as a kid and then guitar, and bass guitar in several bands, while getting into woodworking at the same time. Ten years ago his older brother got a ukulele, and Morin decided he wanted one too. But he didn’t want to pay, and since he’d been making furniture out of wood for a while, he decided to make his own instrument. That first attempt was fashioned out of a gourd bowl to which Morin added a neck and strings. It sounded a little heavy, but Morin was in love. Morin began honing his craft just as he’d honed his woodworking skills and his music skills, by reading and doing and using the oh-so-21st-century tool, the Internet. To this day, he’s had no formal woodworking education. The artist rarely buys wood. Instead, he gleans most from scraps he finds on the side of the road, from his own yard and the lot next door or by Dumpster diving. It helps him keep his prices lower. Morin’s freedom of approach has led to some creative instruments. His clients span the country, from California to Texas to Michigan. Morin spends about two weeks, give or take, on each instrument he makes, first splitting the wood, thinning and shaping it and gluing the pieces, before adding a bridge, frets and four strings. The process requires incredible precision. As ukuleles grow in popularity, Morin hopes to establish a niche for resonator ukuleles. The specialty instruments use an aluminum cone that creates a fuller sound. His models have gotten rave reviews so far. The next year will be an adventure for Morin, one he hopes will feed his creative spirit and his soul. That spirit is easily felt in his workshop. Part “This Old House” and part Santa’s workshop, the space has an ethereal quality to it, and it is easy to forget where you are. A delicate sheen of dust covers pieces of wood that range from log to honed boards soon to become beautiful instruments. Here, in a double-wide shed, at the back of a house, in a neighborhood just outside of downtown Greenville, there are ukuleles everywhere.